SO IT'S been a while since I've posted anything...or coded anything. I haven't tested it with an AtariVox myself - but Nathan did and it seems to work fine. What does it do? It's a way to quickly play with your AtariVox using your 2600. Add/edit/adjust sounds and control codes and then play 'em! Trigger switches between PLAY and EDIT modes. When in PLAY mode, up/down navigates the sound buffer. 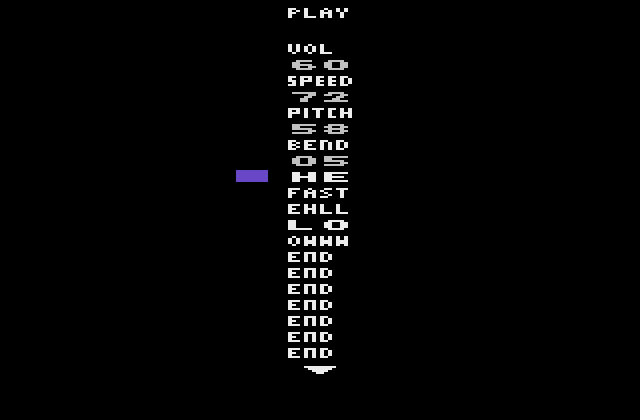 Right begins playing (i.e., sending codes to the AtariVox) immediately, from the cursor position. Left stops playing immediately*. When in EDIT mode, up/down changes the currently selected value. Left deletes the current value, right inserts a value at the current position. *Immediately is not entirely accurate - since the AtariVox has an internal buffer, the AVoxEditor will send 60 codes/second while playing; hitting left (to STOP) will only stop the sending of codes, but the AtariVox will continue speaking. So, for most code strings, it will send all codes to the AtariVox in less than a second, regardless of how long it takes to speak. A few other notes: switching to EDIT mode will stop the sending of codes. Hitting play will immediately begin sending codes from the cursor position. The buffer is 96 codes long.